Corsair have a brief, but very successful, lineage in liquid coolers, with their H100i remaining a popular choice for new builds. Their latest cooler, the Corsair H115i Pro, is hoping to throw some more RGB into the mix, but not only that, it’s bringing the fantastically silent maglev fans along for the ride. Want the greatest loopy chiller to grace our test bench? Here are the best liquid coolers around. The H115i Pro comes with two 140mm maglev fans, a brand new pump design, thinner tubing, and a sleek new radiator. It also launched alongside the extended 360mm H150i Pro. The radiator is a little more low-profile, and feels a little more premium – as it rightfully should at $140 / £135. The new pump is a little more of a mixed bag, however. On the one hand, without the RGB lighting radiating from the edges and front of the pump design, it can look quite dated – I think it’s the silver finish that does it. On the other hand, the installation is exceptionally easy, and once the system boots up, that divisive style is quickly eclipsed by the beam of multi-coloured light exuding from it. Even though the design is far more vibrant than the H100i V2 pump when it comes to lighting, I can’t help feel like Corsair missed a trick here. Considering the RGB plastered on the box, the H115i Pro could have been a little more inspired. It just looks a little plain compared to the NZXT Kraken X62. Though I suppose the words ‘pro’ and ‘rgb’ are often on opposite ends of the spectrum when it comes to product design. Surprisingly, Corsair haven’t adopted the same vibrant RGB lighting they are synonymous with on the fans themselves – which feels a little off for an ‘RGB’ namesake. I suppose pricing had some consideration here. The H115i Pro features two 140mm ML-series fans, which are exceptionally quiet – even at their max rated 1200RPM. Magnetic levitation fans are certainly a worthy investment for any tranquil-minded gamer that can’t stand the hum of a PC chugging along. They’re the reason the H115i Pro is the liquid chiller we recommend in our (almost) silent PC build. 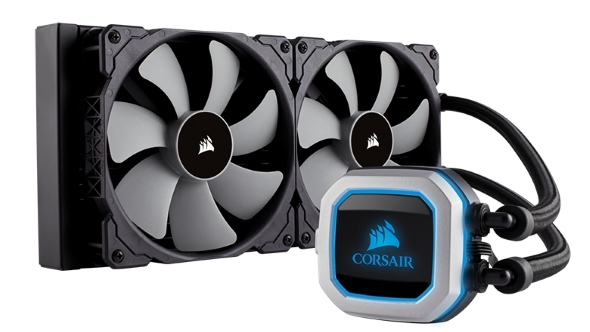 As if Maglev wasn’t enough, Corsair have also adopted a zero-RPM mode with the H115i Pro, preventing even minimal fan noise below coolant temps of 40°C. You will have to utilise the splitter provided and control the whole unit through the Corsair Link software to do this, however. Any errant fan curves that Corsair Link may induce are far less noticeable with the maglev fans, although its RGB controls are a little lacking. The H115i Pro will benefit when Corsair decide to implement more in-depth lighting control, be it from within their CUE software or otherwise. The H115i Pro’s performance is admirable, and perfectly capable of holding its own. It does, however, struggle to match some of the – sometimes cheaper – competition by a few degrees. If you are spending more on this cooler, you are likely doing it for the low-noise factor. In that regard, the H115i Pro is worth the silence. While the H115i Pro may not be the pinnacle of cooling efficacy, you still get a very capable chiller with a snappy design that will likely compliment most builds. Most importantly, however, it’s exceptionally quiet – and silence is golden. I had to put my ear so close to hear any whir from the fans that I nearly gave myself the Van Gogh look. I’m putting Maglev fans on everything from here on out: my case, my GPU, my ceiling fan, my editor, and my raucous next door neighbours. Everything. Ah… sweet, peaceful silence.